Although no longer the capital of Seoul's art and music scene, present-day Hyehwa is a neighborhood that still bursts with creativity and youthful energy. 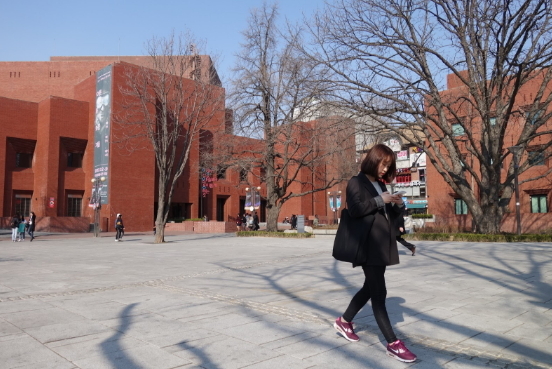 The area is situated in the northeastern part of the capital and is also known as Daehangno, a nickname derived from dehag, or "university," due to its close proximity to quite a few of Seoul’s learning institutes. Over the past decade, Hongdae has risen to the top of the ranks to claim the spot as the city’s premiere youth culture district, lessening Hyehwa to a mere a notch in the history of Seoul’s culture boom. 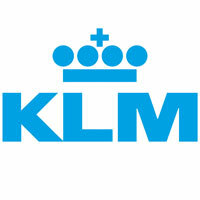 Today, it remains off the radar to most tourists and is even often overlooked by locals. 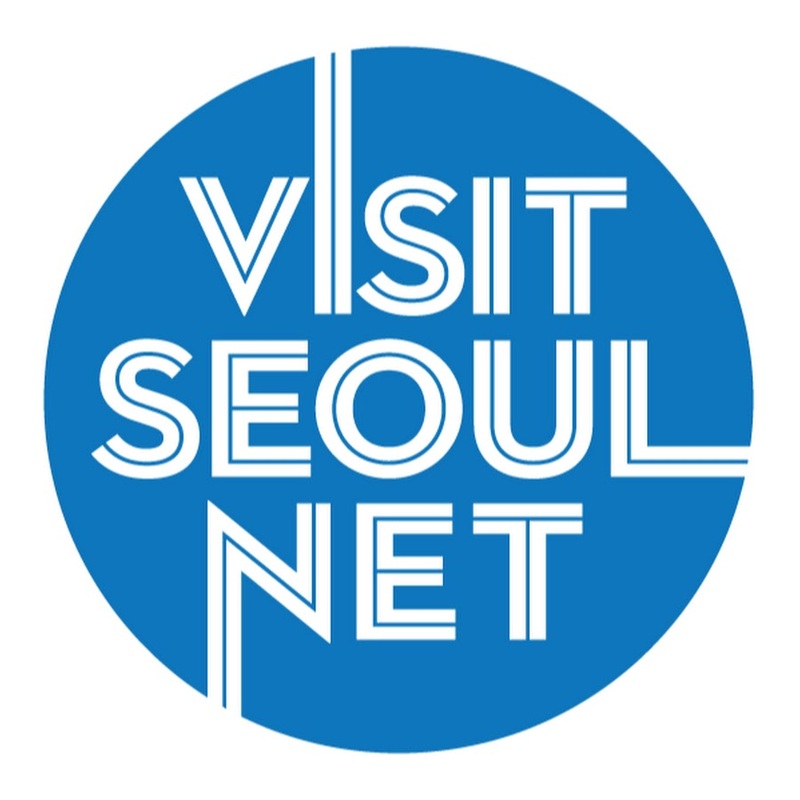 Nevertheless, it remains to thrive as Seoul's theater district—with over 80 independent theaters showing performances on a daily basis—and is brimming with inexpensive eateries, eye-catching cafes and green spaces to boot. The neighborhood, while seemingly typical on the surface, is one of surprises. It just takes a bit of digging to discover them. The first of these gems is Hakrim Dabang, one of Seoul’s oldest dabang, or coffee shops, and is located just outside the subway station. The cafe doesn’t look like much from the outside, but its interior is a treasure trove of antiquities. Classical LPs, vintage speakers and black and white photographs of famous international musicians decorate the entirety of the place, and every detail of the cafe seems to possess the spirit of earlier times. Even the coffee—the cafe’s own blend—stirs up feelings of nostalgia. 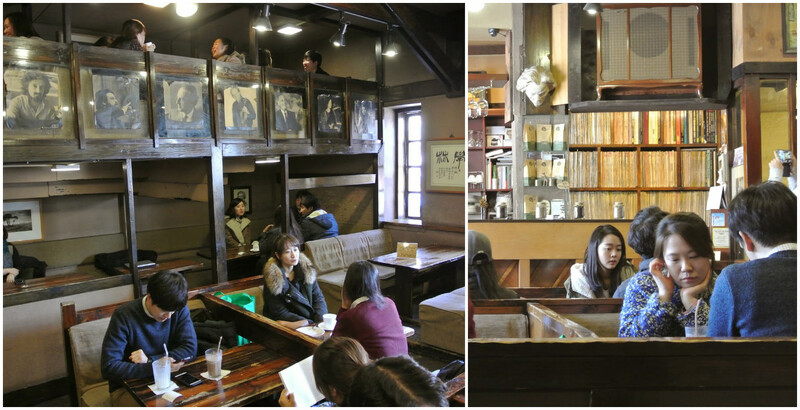 Not much has changed since its opening in 1956, when it was a popular hangout for Korean students to discuss philosophy, literature and art during the country’s struggle for democracy. The one exception would be the cafe’s patronage. Nowadays, it’s more popular than ever with Hallyu fans, as it was the filming location for K-dramas My Love from the Star and The Heirs. 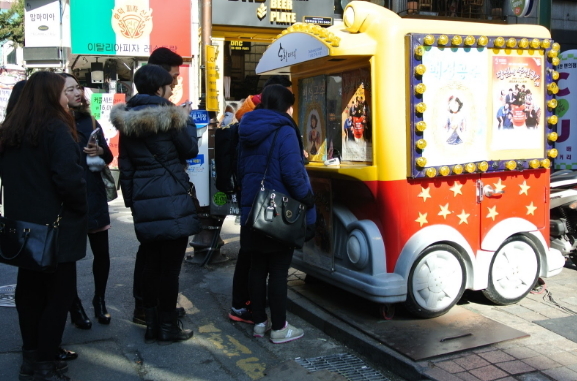 Get there at 10am, when the cafe opens, to claim the booth where actor Kim Soo-hyun was seated during the filming. If you’re a more modern guy or gal, b2project might be a more appropriate option. Part cafe, part gallery, this cozy space is a haven for both coffee lovers and design aficionados. Enter the first floor, place your beverage order and take in the cafe's tasteful decor. Colorful paintings adorn the walls and quirky lighting fixtures hang from above, while miss-matched chairs and tables create a comfortable environment for chatting or reading a book. Before you go, take a look at the gallery downstairs, which features an array of modern Scandinavian furniture. If you've got money to burn, you can purchase the wares on display, which start at a whopping one million won. Now that you're properly caffeinated, follow the signs up the hills to Naksan Park, one of the best places to get a bit of fresh air in the city. 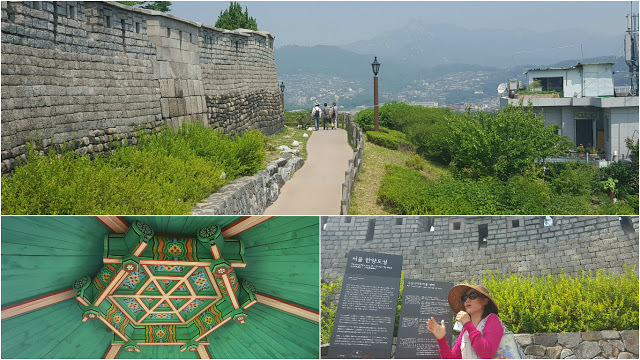 The park itself offers some incredible views of downtown Seoul from the city's old fortress wall, but the real highlight is the collection of sculptures and murals that embellish its paths which wind into the residential area of Ihwa-dong. This district of urban art, collectively known as Ihwa Mural Village, was originally a beautification initiative of the Ministry of Culture and Tourism, and is unique in that rather than being a contrast to the dilapidated buildings that line the streets, it blends so that it appears as if the installations and paintings are at one with the spots they occupy. The decrepit characteristics combined with the personalized art make this part of the area far more charming than the affluent but sterile neighborhoods south of the river. 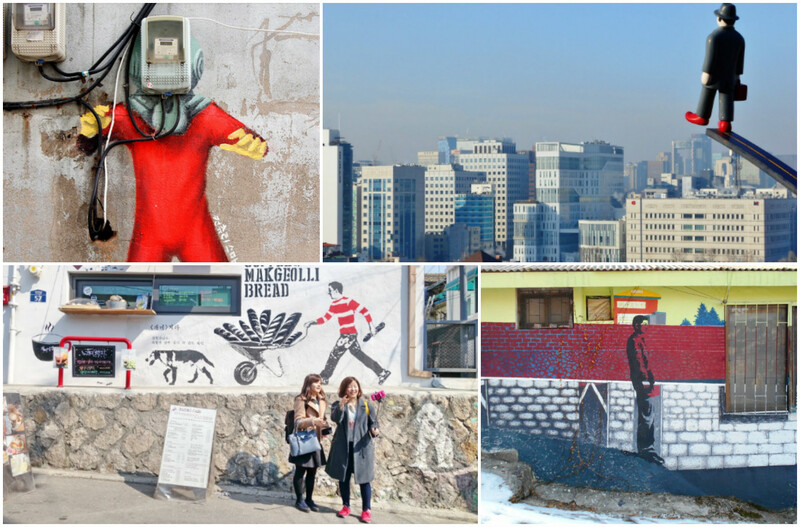 Fans of Running Man and SBS drama Rooftop Prince may recognize a few of the friendly murals, as they were featured on the shows. Don’t worry about sticking to a set route here; to fully appreciate the village and find some of the hidden murals, it’s best to have a wander around. There’s plenty of English signage to assist you in locating the hot spots of Hyehwa. Be sure to keep an eye out for the flower and fish staircases, the cute gang of superheroes and the scuba diver. Pop into one of the many small snack shops for a quick bite or sample the makgeolli-based dishes, including makgeolli baked goods and slushy makgeolli cocktails, at Gaemi Dabang, which is conveniently located in the center of the village. Wind your way back down to Hyehwa Station for lunch. Masizzim has drawn a lot of attention since its appearance on Tasty Road, a TV show that seeks out Korea’s best restaurants, but not just because of the publicity. 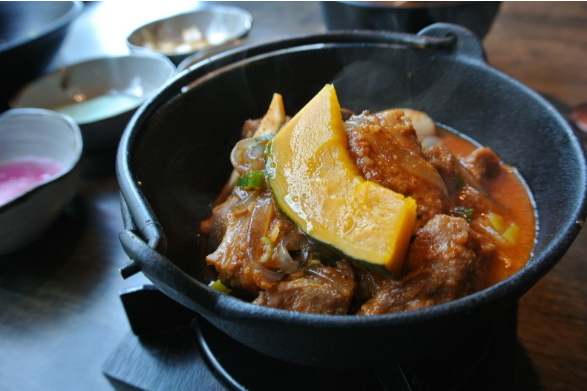 Here, it’s all about jjim, a stew of steamed or boiled meat or seafood, and is one of Korea’s most underrated dishes. Chose either pork or beef ribs, and your lunch will be delivered boiling hot (literally) and loaded with veggies, served alongside plenty of sides, including a chilled radish soup which balances the spice of the stew. The meat is of excellent quality and comes right off the bone. Be prepared to get addicted! One street over is CoCo Curry, another addicting restaurant, that serves up Japanese-style curry dishes customizable to your preference of size, meat (try the pork cutlet) and spice level from zero to ten. No trip to Hyehwa would be complete without shopping. The neighborhood is cluttered with affordable clothing shops, most of which carry the same trends sold in Dongdaemun, but are far more organized. The downfall is that many vendors won't allow you to try on their wares before you buy them, but it's worth asking, anyway. 10x10 is a must-visit multi-store that sells just about everything. 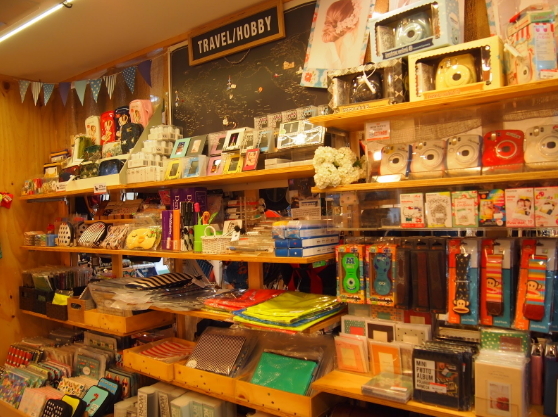 The focus of the shop is on design and many of the lifestyle products for sale, which include clothes, bags, jewelry, candles, kitchenware and stationery, are designed by Korean artists. There's even a florist and gift-wrapping center in case you're shopping for someone other than yourself. But where's the fun in that, right? Don’t miss the second floor of the shop, which boasts an even bigger variety of clothes and footwear. 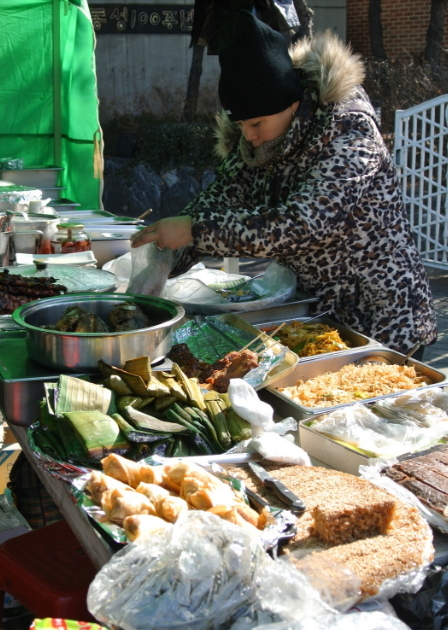 On Sundays, make your way toward Hyehwa Rotary for a taste of Southeast Asia at the Daehangno Philippines Market. Many Filipino expats gather here, usually after mass at Hyehwa Catholic Church, to congregate, pick up hard-to-find snacks from the motherland and gorge on specialties such as pork adobo, lumpia (egg rolls) and pancit (Filipino noodles). The Filipino Market is small and the seating for the food stalls is limited but sharing a table with strangers makes this market experience even more memorable. Don’t be surprised if a vendor offers to hand-feed you an empanada or fried plantain… it’s family here, and the gesture is a testament to the warmth and hospitality Filipinos are known for. As the sun begins to set, street performers abound and one of the best places to see them in action is outside exit 2 of Hyehwa Station at Marronnier Park, a small but charming square named after the large marronnier (chestnut tree) growing in its center, which produces beautiful blooms of red and white in the springtime. Recently renovated, the park is a nice open space that often hosts free performances and concerts. Weeknights are a bit calmer and the location is a peaceful place to relax after a long day of wandering. 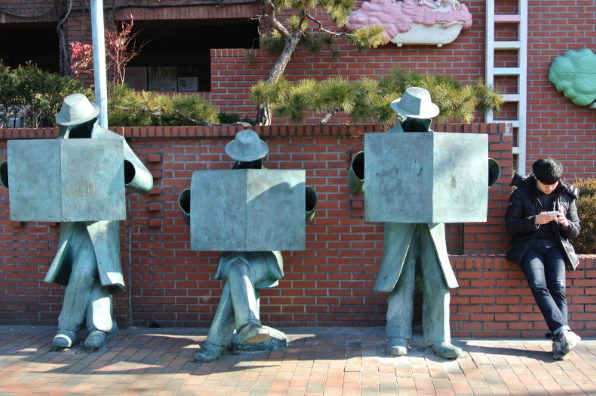 In addition to street performers, the boundaries of the park are often overloaded with touts advertising the latest plays. Not many of them speak English, so it’s better to stop by the information center in the park to see what’s on, check out the showtimes (usually 1, 2 or 5pm), and if you so choose to do so, purchase tickets. 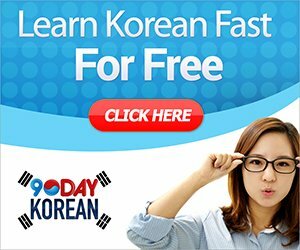 It should be noted that most of the performances are only in Korean, but a few theaters offer foreign language subtitles. 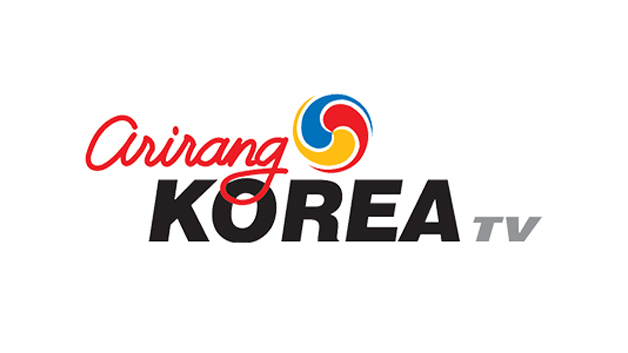 Language aside, the real pleasure of attending a show in Hyehwa is in experiencing an intimacy and connection with the local community and culture. Located around Marronnier Park are loads of street food vendors, so if you haven’t sampled tteokbokki, sundae or giant waffles stuffed with ice cream, this is the place to do it. There are a number of affordable eateries, BBQ joints and cafes around the park as well, all of which are of similar quality. There's no shortage of nightlife venues in Hyehwa and one of the area’s best kept secrets is Jazz Story, an obscure music bar. Shrouded in metal work, it seems as if a very talented and creative blacksmith went to town with the interior of the place. Yet, for as industrial as the metal intends the bar to be, velvet-covered chairs, shelves of vinyl records, and clusters of candles create an intimate, romantic atmosphere. Drinks aren't anything to write home about, and there's a 5,000 won cover charge per person added to the bill, but the live music performed by Jazz Story's house band every night of the week beginning at 8:30 (or 8 on Sundays) is more than worth it. A newer favorite is Mix & Malt. This homey bar uses fresh ingredients—many of which come straight from the bar’s garden—to concoct some of the best cocktails in the city. In addition to the classics, Mix & Malt also has some signature and seasonal specialties on the menu, like its Elderflower Mojito. Presentation is also superb. Because so much effort is put into each drink, they take a bit longer than usual to make it to your table, so be prepared to wait. Fortunately, there are plenty of ways to entertain yourself, from board games to a shuffleboard table. On the second floor, there is a fireplace... a feature that is particularly nice in the colder months. After a few rounds at Mix & Malt, you can easily catch the last train at nearby Hyehwa Station, or hail a taxi, as there's always one passing by. 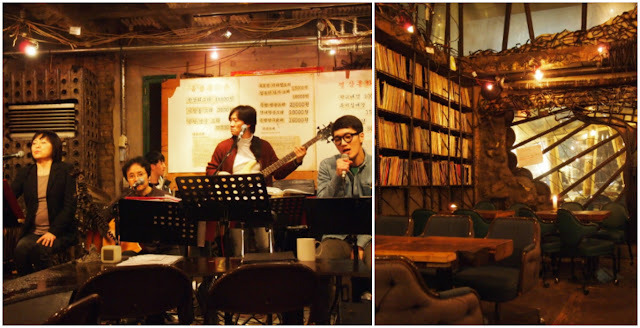 Don’t be surprised if you decide to go back; Hyehwa has that effect, and with the increasing trendiness of areas like Hongdae and Itaewon (and as such, increasing crowds), Hyehwa is a quieter, alternative hang-out. To Get There: Take the Seoul subway to Hyehwa Station (Line 4, Exit 2). 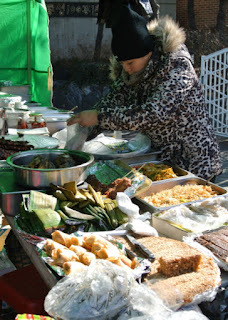 Words and photos by Mimsie Ladner of Seoul Searching unless otherwise noted. 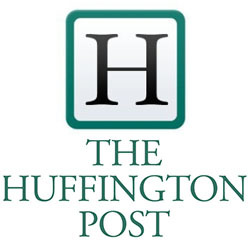 Content may not be reproduced unless authorized.